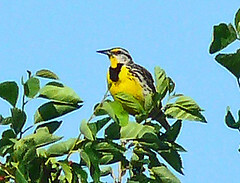 I mentioned the Eastern Meadowlark several times in my book. Though not a rare bird in general, it is extremely hard to find in Manhattan, and is not reported in Central Park every year. It is more regular in Queens and Brooklyn, though still an uncommon bird worth reporting anywhere in New York City. I ran many miles over the North End of Central Park and over Randall’s Island in 2012, during my big year, trying to observe this bird. I even visited Inwood Hill Park in search of it. Recent reports of it in Queens suggested that a visit to nearby Randall’s Island was in order. It has been reported before on Randall’s Island and along the East River in Manhattan. Randall’s Island ought to be tremendously appealing to Eastern Meadowlarks, as it is filled with acres of mostly-unused grassy baseball and soccer fields. I ran across the 103rd Street pedestrian bridge and began birding the south end of the island at 10:50 a.m. I saw many kinglets of both species there, but nothing unusual. After two hours I had made my way to the northern shore just east of the pedestrian bridge to the Bronx when I flushed a large yellow-breasted bird out of thick grass and into nearby trees. It was my life Manhattan Eastern Meadowlark. It did not want me anywhere near it, and for five minutes I observed it perching atop the shoreline trees and flying from tree to tree. Then I lost sight of it, and was not able to re-find it again. It became my 190th species of the year and my 232nd lifetime in Manhattan. I had been waiting for someone to find a Sora on one of the Central Park water bodies. Prospect Park already had a lingering Sora since late September. Bad judgment caused me to miss the Sora that visited Turtle Pond in September 2011, and I was not about to let the next one go uncounted. So it was with much excitement that I read a Twitter alert (hashtag #birdcp) from frequent birder Ed Gaillard at 4:46 p.m. on Friday, October 12, saying that there was a rail, possibly a Sora, in the planter area at the SE corned of the lawn at Bryant Park. I wasted no time in getting there, and was on the scene in 25 minutes. I knew that I would have just little more than an hour to observe and identify whatever was there before it got dark. Bryant Park can be an excellent spot for various birds to make an extended stay, such as warblers and sparrows, but rails prefer marshes and this park was notably dry. I did not expect any rail would want to stay overnight. When I arrived Mr. Gaillard said he had not seen the bird since his tweet. He showed me the few photos he had taken, which I told him were clearly of a Sora. After another 20 minutes of searching, I was getting a little nervous that the bird might have gotten spooked by the attention and sneaked into another planter area. But Ed said he had briefly seen it again while I was looking from the other side, so the bird still had to be there. Within minutes the bird began walking west through the planter giving us brief but clear views. I noted the light yellow bill and white lines on the wings. It certainly was a Sora, most probably one in its first year. Now that I knew for sure that the Sora was still present, I issued an NYNYBIRD text alert. A handful of birders responded to it. I lingered until just after 6 p.m. to help direct viewers to the bird. Some viewed it as late as 6:30. I was surprised to see a report the following morning that the Sora was still present in the same place. I was even more surprised when the Sora was found there again, not just on Sunday, but also on Monday, Tuesday, Wednesday and even Thursday! The Sora became my 231st lifetime species in Manhattan and my 186th of 2013. In the following days, more rare birds appeared in Central Park. On Sunday, October 13, there were two reports of Vesper Sparrow in the park, one in the North End by the Compost Heap, and the other just west of the Pinetum. It turns out that the former flew off soon after the report. I chose to chase the latter, which lingered in a fenced-off lawn area for most of the afternoon and provided good views to many. It became species number 187 for me this year. Then on Tuesday the 16th a Wilson’s Snipe was reported around midday on the rocks lining the shore of the Lake just east of the Oven. In general, this is a common bird, but it is scarce in Manhattan and observed perhaps only once per year in Central Park. I had my first one in April 2012 at the Upper Lobe. This one was my 188th species of the year. At 4:52 p.m. today a text alert arrived of a Lark Sparrow on the Great Hill north of the balancing rock. 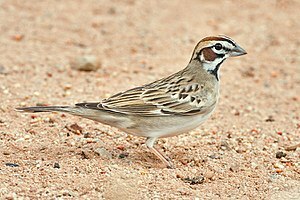 With the strong westerly wind flow of the previous few days, I had been wondering about the possibility of Lark Sparrow. An eBird report that arrived less than 50 minutes earlier indicated the bird was first seen briefly this morning by a couple of observers, with the last sighting at 11:20 a.m. I was late getting the text, and then I had to change into running clothes. But I ran fast and arrived on the Great Hill at 5:19. There were no sparrows near the balancing rock, but I saw two birders intently observing something at the NE end of the sloping meadow nearby. It turned out that they did not have the Lark Sparrow, so I started searching the area, and soon split from them to check higher on the hill. There I found a flock of at least twenty Chipping Sparrows and twenty Dark-eyed Juncos. Soon the other birders began walking toward me, so I met them and suggested we examine the flock. We walked toward it, and when I looked again the Lark Sparrow was 25 feet away right in my binocular view and I called it out. It took some time to get everyone of the six birders on it, as there were many sparrows moving about, but eventually all saw it. It is large for a sparrow, with a dramatic, unmistakable head pattern. We observed the bird for roughly 15 minutes before the flock frightened and moved north. The other birders move on. I pursued the flock to the far NE end of the Great Hill, where I last saw the Lark Sparrow at 6:15 p.m. just as darkness was falling. The last prior report of Lark Sparrow in Manhattan was just over two years ago on 13 September 2011 at the same initial location, the Great Hill’s southern slope. I was my 230th lifetime Manhattan species, and my 185th of the year. Mr. Chang seems to have a way with Grasshopper Sparrows. He also was the finder of the one near the Lawn Bowling courts in May 2012 about which I wrote in my book. I ran to area, arriving at 11:55 a.m. I was first on the scene, and I saw neither the bird nor its original finder. I did see some House Sparrows on the lawn, so I scanned them and then circled around the lawn. As I was searching the opposite side of the lawn, another birder called out that the bird was appearing by the fence just west of the stream. I turned and got a good look. 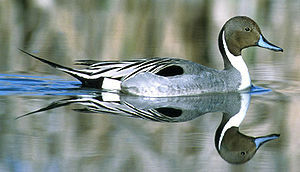 Its eye ring, buffy throat, and overall shape and coloring left no doubt as to its identity. The bird remained in view for five minutes and then seemed to disappear into the brush. I remained on the scene for another twenty minutes as seven birders watched for it, but it did not reappear. It was reported again later in the afternoon. 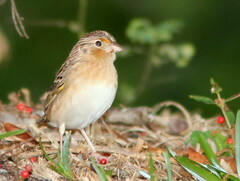 The Grasshopper Sparrow has been appearing roughly once per season in recent years in Central Park. As we begin the fall sparrowing season, I am hoping that more ammodramus sparrows will show up in Central Park. I visited the northeast shore of Randall’s Island on Monday, September 30, and found the lone Saltmarsh Sparrow (also of the ammodramus genus) that had been found by another observer the day before. It was my 183rd species of the year. Today’s Grasshopper Sparrow was my 184th.